In 1839 construction began on a prison at Cockatoo Island, the largest island in Sydney Harbour, to house convicts withdrawn from Norfolk Island. In the following years five of Tocal's convicts were imprisoned on Cockatoo Island. James Forrester was at Tocal in 1832, became free in 1838 and in 1848 was sentenced to five years in irons on Cockatoo Island for horse stealing. George Mildmay was at Tocal between 1830 and 1833, became free in 1838 and received a three year sentence to Cockatoo Island in 1849. Tocal convict Thomas Smith, a bushranger of some notoriety, was sentenced to 14 years hard labour in irons in 1832 for armed robbery and served seven years of his sentence at Norfolk Island and the remainder at Cockatoo Island. Tocal's most memorable link to Cockatoo Island, however, came from a man born free in the colony. Fred Ward worked at Tocal as a horsebreaker in 1853 and in 1856 he was sentenced to 10 years hard labour for stealing a mob of Tocal horses. He served four years at Cockatoo Island before gaining a Ticket of Leave, but one year later he was again on the island for 'receiving' a stolen horse. In 1863 Fred Ward became one of the few ever to escape from Cockatoo Island when he swam to freedom and began his career as the notorious bushranger, Captain Thunderbolt. 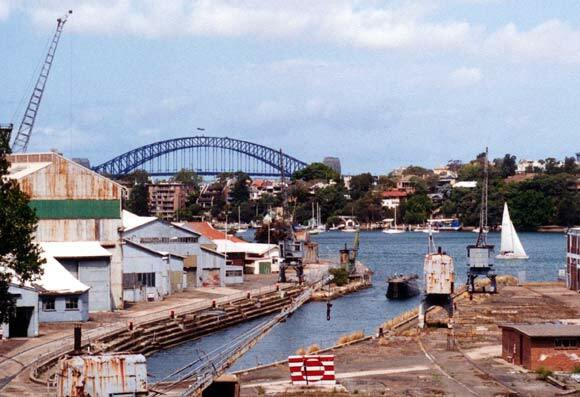 Below: Cockatoo Island, showing the original Fitzroy Dock excavated and built by prison inmates from 1851 to 1857.